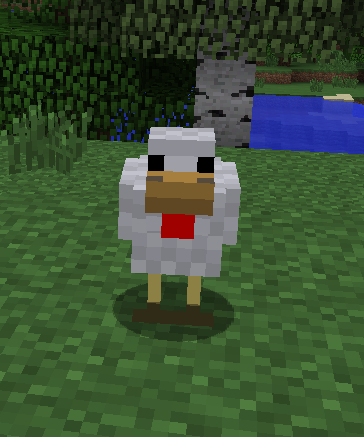 Chickens are Mobs that are found everywhere in the Overworld. They have two health points and will not attack. They can drop 1-2 Feather, 1 Raw Chicken, and 1-3 experience points when killed. If killed by a fire they will drop Chicken that is cooked instead of Raw Chicken. Another item they drop is Egg, but this is done once every 5-10 minutes while the chicken is alive. Chickens will only spawn on Grass, unless the player shoots an Egg in which a few can spawn instantly. Chickens do not take fall damage as they glide down if pushed off the edge of a cliff. They are able to bread with Wheat, which will instantly create an offspring. The only mob that will attack Chickens are Ocelot Mobs so make sure they are not in any Fences you have made for Chickens.